In stock -This product will ship today if ordered within the next 13 hours and 13 minutes. Tenscare Perfect EMS is an easy-to-use dual channel unit, combining TENS and EMS to provide muscle toning, rehabilitation and pain relief. 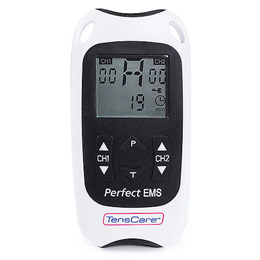 The TensCare Perfect EMS can aid muscle rehabilitation by strengthening weakened muscles using Electrical Muscle Stimulation. This is especially useful where patients are unable to perform physical exercise. Use in conjunction with physiotherapy. Effective and no side affects. Do not use if you have a heart pacemaker or have a heart rhythm problem. TENS or electrical stimulation in the direct vicinity of a pacemaker may affect some models. If TENS or electrical stimulation is applied on the front of the neck this can affect your heart rate. Very strong TENS or stimulation across the chest may cause an extra heartbeat. 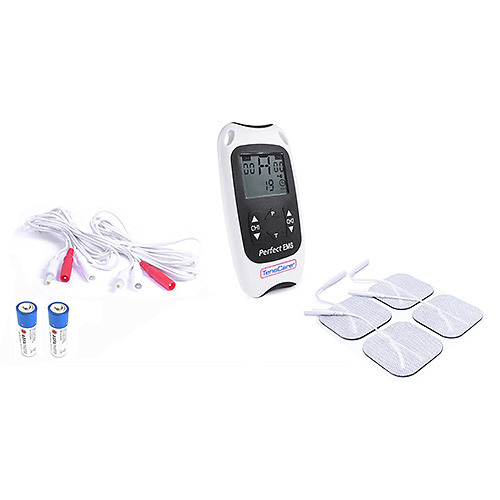 Below are reviews of TensCare Perfect EMS Kit - Muscle Toning & Pain Relief by bodykind customers. If you have tried this product we'd love to hear what you think so please leave a review.